If you're planning to buy horses, you probably already know how much you're willing and able to spend on an equine companion. But the purchase price is just one part of the cost of a horse. In fact, the cost of owning a horse can range dramatically depending on the breed, age and disposition of your horse, where you live, where you plan to keep the horse and what type of work you plan to do with the horse. Before you buy a horse, it's important to think through all the costs associated with your new friend. That way, you can budget for the extra expense – instead of being surprised down the line. Need a hand thinking it through? Plan ahead for the true cost of a horse with this guide from Equine.com. The easiest way to keep the cost of a horse low is to board him on your own property. However, if you live in an urban area or don’t have the facilities to properly board and pasture a horse, you'll need to find a stable in the area that can keep him. The cost of keeping a horse varies widely depending on where you live and the level of service your stable provides. Simple pasture boarding can cost as little as $100 a month. However, stable boarding can cost $500 or more. If you plan to keep your horse on your own land, you’ll also need to consider whether the property is adequately equipped. 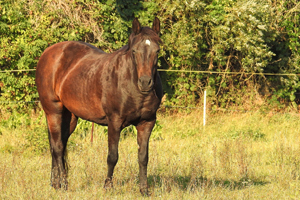 First, you'll need about two acres of good pasture per horse for grazing. You'll also need well-maintained barn space, particularly if you live in a cold climate. Most horse owners spend about $60 to $100 per month on hay, salt and supplements – and some spend much more, particularly if they feed grain. Maintaining your horse's hooves adds even more to the cost of a horse. Whether or not you plan to shoe your horse, you'll need to have a farrier check and trim his hooves every two months or so. This usually costs around $25 or $30. Add in shoeing, and you could pay $80 to $100 every two months. Routine medical care is an additional cost of owning a horse and includes vaccinations, de-worming and annual teeth cleaning. For a healthy horse, this can cost as little as $300 a year. However, if your horse gets injured or ill, you could pay hundreds or even thousands for a one-time treatment. Although you can't predict such expenses, prepare yourself for the possibility before you buy a horse. If all these costs – as well as optional expenses, such as tack, riding lessons and show entry fees – leave you feeling daunted about buying your first horse, remember that there's no substitute for an equine companion. Although the cost of a horse isn't small, the rewards are large. As long as you've planned ahead and can afford your horse, you won't regret it – so go ahead and start shopping the Equine.com horse classifieds.